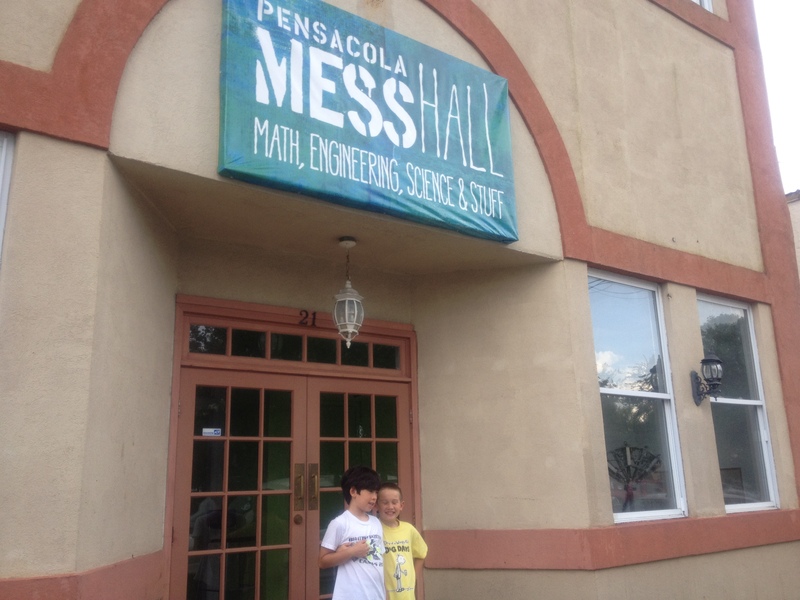 This summer my sons and I have already paid two visits to Pensacola, Florida’s newest science museum, the Pensacola MESS Hall. Where MESS = Math, Engineering, Science, and Stuff. My husband is now asking us to join us this week (we had previously gone while he was at work) and we’ll be squeezing in one more visit before the facility temporarily closes on August 18th. What is the MESS Hall? At the MESS Hall, everything — and we mean everything — is meant to be hands-on. There is guidance for math and science activities, but the kids can follow the directions… or take things in a completely different direction. There is no wrong answer at the MESS Hall. The MESS Hall has this cafeteria feel when you walk in. There are tables with cafeteria-style trays filled with experiment supplies, kids are sitting at the tables performing experiments. There’s a counter in the back corner. 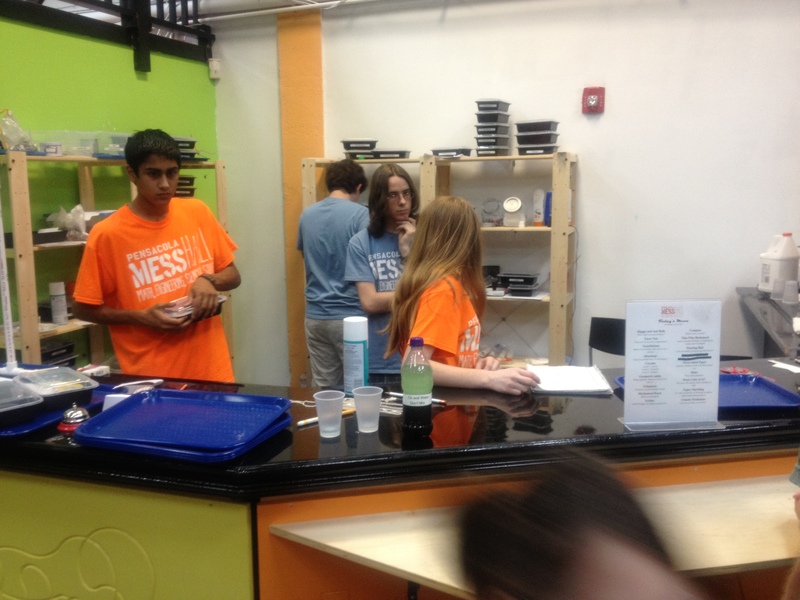 Again, like a cafeteria, there’s a menu of “MESS Kit” experiments available, and the kids (and adults!) can walk up to the counter and “order” an experiment to perform. There is a guidebook to accompany the materials. The guidebook follows the scientific process, presenting the procedure, prompting hypotheses, observation and changing of variables. Then the experimenter is asked to form conclusions. At the end of the little guidebook is a more thorough explanation. Where have you been all my life? After years of visiting kids’ museums filled with a few interactive exhibits here and there, projects such as those offered at the MESS Hall are typically tucked in a back corner at other places. The museum visitors experiencing the scientific method are generally in a large auditorium, participating in a Mr. Wizard’s World -type of program. The MESS Hall is the brainchild of Dr. Megan Pratt, a chemist and neurobiologist by education, who current serves on the Pensacola City Council and is the education director of the Institute for Human and Machine Cognition (IHMC), a research non-profit affiliated with the Florida University System. Dr. Pratt’s Science Saturdays at the IHMC were so immensely popular, she sought funding to expand the style of hands-on science exploration to a full-time prescence in downtown Pensacola. As described in this article from earlier this summer, Dr. Pratt received enough funding to run a trial-version of the MESS Hall in Downtown Pensacola during the school districts’ summer vacation. A science experiment in and of itself, so says Dr. Pratt. After this summer trial run, which ends on August 18th, the Friday before school starts in our community, the museum board plans to embark on a fundraising campaign to raise enough capital to establish a larger permanent location in Downtown Pensacola starting in 2013. Why Do My Sons and I Love the MESS Hall? Let Me Count the Ways. There is no right or wrong answer to these experiments. There is no timeline for conducting the experiments. Kids can be as messy as they want (or as messy as their parents can handle). The experiments available cover a wide spectrum of science disciplines: biology, robotics, chemistry, geosciences, electromagnetism, optics and chromatography…among many others. 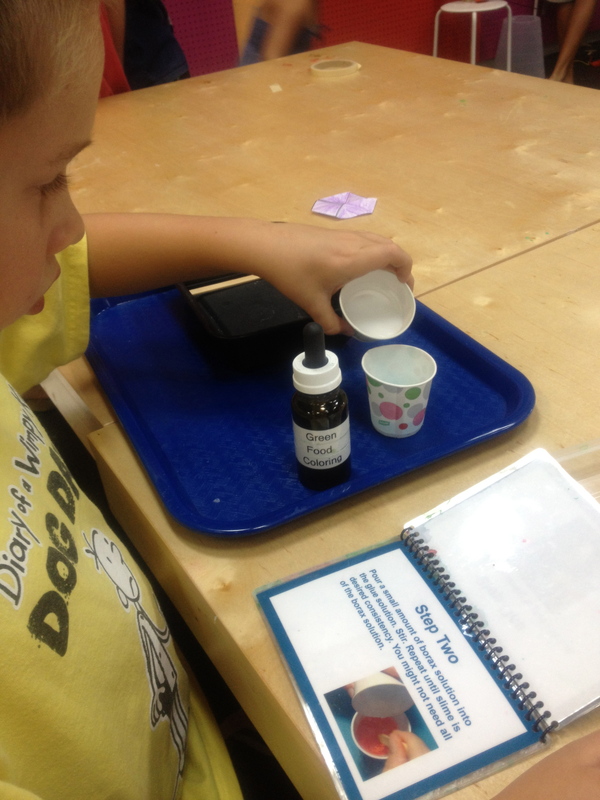 Your kids don’t want to sit still for experiments? That’s okay. There are many activities on the periphery: a harmonograph, a Van De Graff generator, hands-on math puzzlers, a wall on which kids can build marble runs, and hallways filled with optical illusions. 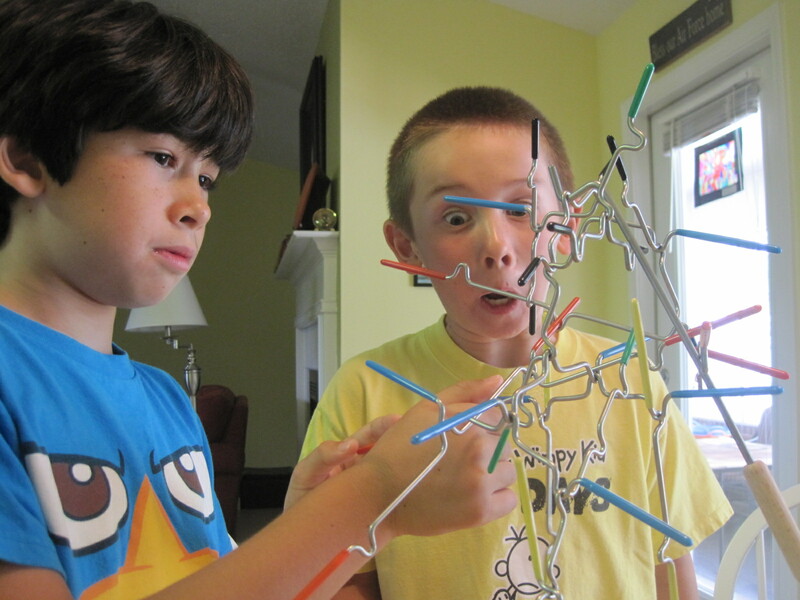 Kids are exposed to the scientific method, something I hold near and dear to my heart, in a safe and fun way. At $5 per person, consider what one gets: unlimited access to experiment materials, space for conducting the experiments — and making the messes, and kids being able to interact with others all in the name of science. I hope this idea of a hands-on-only science museum catches on in other locations. Many other museums already have very excellent hands-on/interactive areas within their larger facilities. San Francisco’s Exploratorium led the way as one the earliest hands-on-museum experiences. The Museum of Life and Science in Durham, North Carolina, the Discovery Place in Charlotte, North Carolina and the Durham Museum in Omaha, Nebraska all have outstanding programs. My family has also seen awesome traveling programs that are completely hands on, such as the rooms fully of Kapla blocks and the U.S. Department of Treasury’s Moneyville program. Can you tell we like museums just a little? I can’t wait to see what the future of the Pensacola MESS Hall brings. I overheard one of the volunteer directors mention that the facility has been so popular, he’s confident in their ability to raise the money to continue Dr. Pratt’s dream! I’ll help out as much as I can! ← Name the GeekMom Pony!